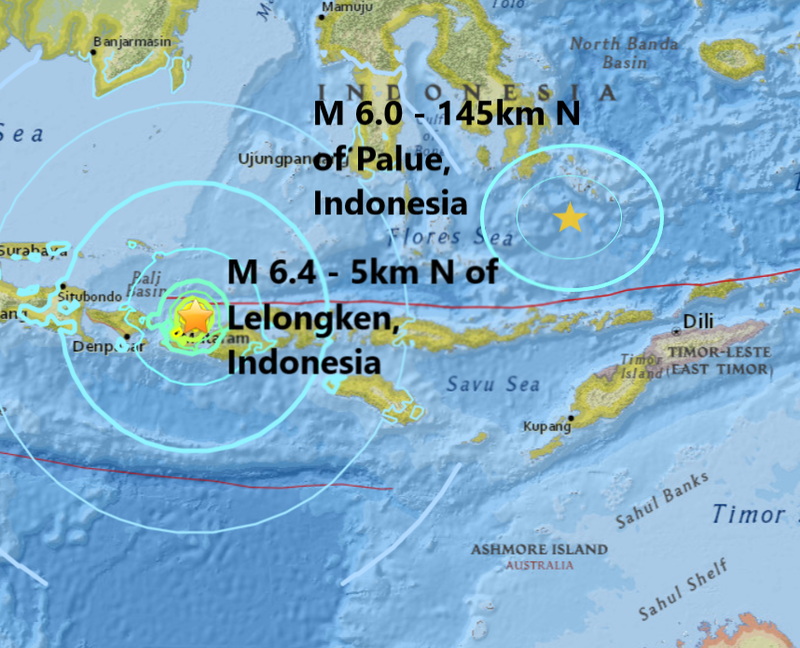 The U.S. Geological Survey said the quake had a magnitude of 6.4 and its epicentre was 1.4 kilometres (0.8 miles) southwest of Lelongken, Indonesia. It had a depth of 7 kilometres (4.4 miles). Authorities issued a yellow alert, with 10 people dead and many more injured and there are reports of widespread damage and destruction to buildings. Tourist Jean-Paul Volckaert was woken in his hotel by the quake and said: "We jumped out of our bed to avoid anything falling on our heads." He said: "The water in the pools was swaying like a wild sea," as tremors shook the island for between "20 to 30 seconds". Indonesia's National Board for Disaster Management tweeted pictures of the destruction. Two showed houses in Lombok which had collapsed in the quake, with a bed still visible among the debris. Tourist destinations have been closed after the country's authorities warned of deadly mudslides. Mount Rinjani national park, a popular destination with hikers, is closed over fears of treacherous slides. Sutopo Purwo Nugroho, from Indonesia's disaster mitigation agency, said: "People are gathering on the streets and in empty fields to avoid collapsing buildings. "The main focus now is evacuation and rescue. Some of the injured are still being treated at clinics." Tourists reported being shaken from their bed and feeling as if their house was collapsing after the quake struck at around 6.50am local time. US model and wife of singer John Legend Christine Teigen is on holiday in Bali at the moment and tweeted: "Oh my. Long earthquake here in Bali". The country sits on the deadly "Ring of Fire", an arc of volcanoes and earthquake-prone fault lines circling the Pacific Ocean. More than 361,000 British holidaymakers visited Indonesia in 2017, many heading to Lombok or go clubbing and party resorts on Bali. The earthquake has not triggered any waves or tsunami yet. Meanwhile, a magnitude 6.0 - 145km N of Palue, made it two major quakes in Indonesia on Saturday, the two quakes brought the total this year to 53 and they were also the 8th and 9th in the month of July.